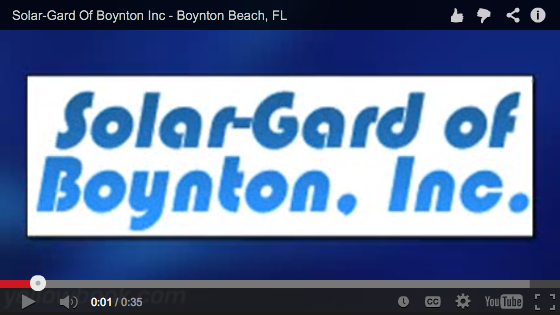 Solar Gard of Boynton Beach Inc. Solar Gard of Boynton Beach Inc. serves all of Palm Beach County for Home window tinting and Commercial window tinting applications, including the areas of: West Palm Beach, Wellington, Royal Palm Beach, Greenacres, Royal Palm Estates, Palm Springs, Lake Worth, Loxahatchee, Tequesta, Jupiter, Abacoa, Lake Park, Palm Beach Gardens, Lantana, Hypoluxo, Boynton Beach, Delray Beach, Kings Point, Boca Raton, and Highland Beach since 1979. We are a professional window tinting company that specializes in quality and service. Window Film can be used to reduce heat and glare, give privacy, add security, increase safety, and reduce the effects of fading by filtering UV rays. Whatever your glass related issue, Solar Gard of Boynton Beach Inc will be able to offer you a suitable window tinting solution. Our window films range from our most popular High Reflective Silver and Plain Frosted and Opaque Window Tinting Films through to our clearer solar and UV films from our Climate range of products. We offer a lifetime warranty on all of our products and a life time guarantee on all of our work. Call us today and learn the straight facts about window Tinting film and What we can do for you! From Jupiter to Boca Raton, Solar Gard of Boynton Beach Inc. is West Palm Beach premier Commercial, Residential, & Automotive window film installer! From Jupiter, West Palm Beach to Boca Raton, Solar Gard is Palm Beach County’s premier Residential, Commercial, & Automotive window film company!